The video was shot across the street from Lord and Taylor department store in Boston. 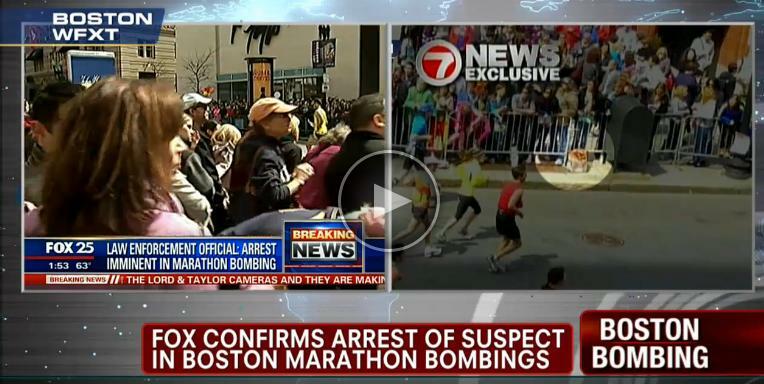 WFXT aired video today that was possibly used to identify the Boston bomber. This screengrab shows a man in a black jacket and white hat. The video was taken an hour before the bombing. It was reported that a suspect had been icaptured on surveillance video taken near a department store between the sites of the two bomb blasts. The Fox 25 source said an arrest was imminent in the case and that cell phone records had helped investigators identify the suspect. A law enforcement official briefed on the investigation told The Associated Press that a suspect was in custody. The official, who was not authorized to divulge details of the investigation, said the suspect was expected in federal court Wednesday afternoon. The FBI, Mass. State Police and Boston police said no arrests had been made after reporters and hundreds of onlookers gathered at the courthouse to catch a glimpse of the potential suspect. A bomb threat prompted the evacuation of the courthouse a short time later. FOX News Insider posted the video. Authorities have video of a man in a black jacket on a cell phone, wearing a gray hoodie and a white baseball cap backwards placing a black bag at the second bomb site outside of the Forum restaurant on Boylston Street and then leaving the area before that explosion.